Students from Marjory Stoneman Douglas High School and those supporting them react, Feb. 20, 2018, as they watch the Florida House of Representatives vote down a procedural move to take a bill banning assault weapons out of committee and bring it to the floor for a vote, in Tallahassee, Florida. 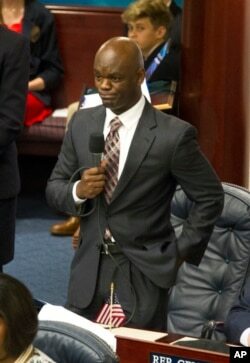 The lawmakers' move followed last week's mass shooting on the students' campus. Florida high school students say they will not let state lawmakers' rejection of a bill to ban assault rifles stop them from taking their fight to the state capital. With the gallery filled with students Tuesday, the Republican-led Florida House turned down a Democratic proposal to ban the guns. Republicans accused the Democrats of forcing the issue after Nikolas Cruz, 19, allegedly used an AR-15 to kill 17 people at a Parkland, Florida, high school last week. Lizzie Eaton, a junior at Marjory Stoneman Douglas High School, site of the shootings, called the legislature's vote "heartbreaking." But she said, "We're not going to stop. We're going to keep fighting for what we believe in. We're not going to let this bring us down." About 100 other Parkland students are expected in Tallahassee on Wednesday, and President Donald Trump will host parents, teachers and students that day for what the White House calls a "listening session" on school safety. Survivors from the shootings at Parkland; Sandy Hook Elementary School in Newtown, Connecticut, in December 2012; and Columbine High School in Jefferson County, Colorado, in April 1999 have been invited. Students from Florida and across the country have expressed anger, in the wake of the Parkland shooting, at what they see as politicians' failure to take steps to stop mass shootings. Before boarding their bus for Tallahassee, Douglas student Ariana Ortega told VOA that the students "are the ones most involved in this. We are the ones who lived through this whole tragic experience, and we are going to be the future leaders of America." Students are planning a March 24 rally in Washington and other major cities called "March for Our Lives." Music stars Justin Bieber, Lady Gaga and Cher have thrown their support behind the march. Actor George Clooney and his wife, Amal, a human rights attorney, said they are donating $500,000 to help pay for it. Meanwhile, White House spokeswoman Sarah Huckabee Sanders tried Tuesday to smooth over the fallout from Trump's controversial tweet Saturday about the FBI, in which he said agents missed signs about the Parkland shooter because it was busy trying to look for election interference collusion between his presidential campaign and Russia. Florida Gov. 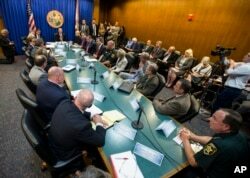 Rick Scott, far center, holds a statewide roundtable on school safety at the Florida Capitol in Tallahassee, Feb 20, 2018. The FBI admitted it did not act on a January 5 tip about Cruz. According to an FBI statement, someone with a close relationship to Cruz called with information about his "gun ownership, desire to kill people, erratic behavior and disturbing social media posts, as well as the potential of him conducting a school shooting." Police said Cruz confessed to killing 14 students and three adults at the high school he was expelled from last year. He was able to buy an AR-15 rifle after clearing a background check. A new Washington Post-ABC News poll said 86 percent of respondents who identified themselves as Democrats said stricter gun control laws could have prevented the Florida shooting, while 67 percent of Republicans said stricter laws could not have prevented the massacre. FILE - Nikolas Cruz appears in court for a status hearing before Broward Circuit Judge Elizabeth Scherer in Fort Lauderdale, Fla., Feb. 19, 2018. Overall, 77 percent of respondents said Congress was not doing enough to prevent mass shootings in the United States, while 62 percent said Trump was not doing enough. In Washington, Texas Republican Senator John Cornyn and Connecticut Democratic Senator Chris Murphy have drafted legislation to improve compliance with background checks. The revisions are still being negotiated. The Cornyn-Murphy legislation has drawn support from Democrats and Republicans, although passage of gun legislation has often stalled in Congress. Democratic lawmakers often call for tighter controls on gun purchases, while Republicans often oppose them, saying they would violate the Second Amendment to the U.S. Constitution sanctioning gun ownership. The Cornyn-Murphy background check measure would not impose new restrictions on gun purchases, but rather attempt to make sure information about mental health and criminal conviction records that legally bar individuals from buying weapons is consistently sent to the National Instant Criminal Background Check System.